A six-foot-tall defender on her university soccer team, Zoe was known for toughness, an aggressive nature, and a fearless approach to playing the game she loved. But when it came to walking the aisle in front of a crowded church to make a public profession of faith, Zoe was scared. Everyone knows that college can be a socially trying time, to say the least. Peer pressure and the need to be accepted drive the decision-making process as teenagers morph into young adults. The latest social media trends can dominate their thoughts. Still, they are also seeking a degree, pursuing a career in a specific field of interest. They are trying to better themselves through education. They ask questions and seek answers—some of which don’t come in the form they were expecting. So it is with students looking to get involved in mission opportunities. Students who have a strong religious background and want to help others. In some cases, reaching out to others during a mission trip can have a profound effect on one’s own life. Working in the communications office at a faith-based university, I have the privilege of hearing many of the stories upon the return of our mission teams. It’s fascinating to hear about the activities, people, and cultures that were touched by students’ efforts and the ideas for future outreach. But what is of greater impact are the stories of students who are truly changed by their experiences. Zoe grew up in California. Religion was not unfamiliar to her, but her family was in no way religious. As a teenager she was leaning toward atheism. Her church experience had not been positive, as the Christians she came in contact with continually offended her while trying to force-feed religion to her. While she was actively seeking a college education, she had no intention of attending a faith-based university. She didn’t want any part of it. A scholarship offer and conversations with the soccer coach changed her mind. 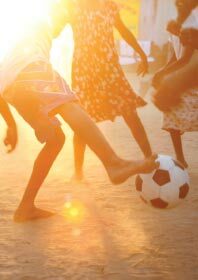 Zoe agreed to attend school, but only to play soccer and study biology—not to be inundated with religiosity. Yet the influence of Christianity from those around her began to change her attitude. Zoe began asking questions and eventually agreed to participate in a medical mission trip to Honduras sponsored by the biology department. Her experience, seeing how God could use her to help others, changed her life. One of the major components of any mission trip is the effect it has on those individuals taking part in the effort. While the life-altering changes aren’t always as dramatic as they were for Zoe, they are nonetheless important. Director of the Wayland Baptist University Mission Center Dr. Richard Shaw says this is something he emphasizes among students participating in missions. “Probably the greatest result of any of our missions is the transformation that occurs, not so much in the people [they’re serving], but the transformation that occurs in the missionary,” he explains. And Shaw should know. He spent 12 years on the mission field before taking over as Director of the then newly formed Mission Center in 2007, and he can speak from experience about the changes missionaries face within themselves. It’s important for students to understand this process and recognize the inherent changes they will experience through the course of a mission trip. Shaw says that is one thing he emphasizes in preparation for trips. Wayland’s Baptist Student Ministries Director Donnie Brown focuses on the same aspect with the student groups he leads, telling students they may feel guilty upon return, knowing that they have so much while others suffer. One such student, Ashley, felt that way after visiting Haiti for the first time. She joined the Baptist Student Ministries group to build rubble houses for people in Haiti after they were devastated by a hurricane. Ashley says she felt guilty, but she was able to better cope with her feelings because Brown had discussed the personal changes missionaries would likely encounter upon their return. Ashley embraced and accepted the changes in her life. She says her experience reminds her to keep things in perspective, be thankful, and not take things for granted. It also promotes a more generous spirit, as she now looks for ways to use what she has to help others. Students looking to get involved in missions, whether foreign, domestic, or even in their own backyard, will find ample opportunities to get involved. The experiences are priceless and meaningful even to those students who aren’t sure what to expect. And the sheer humanitarian aspect can be profound for students who may not be Christians. As Shaw says, it helps pop the proverbial bubble in which we all live and teaches us to reach outside our comfort zones to include those we see as different from us, to break down those barriers and prejudices. There is hardly a more noble cause than using what you have to help others. But students looking to get involved in missions may be surprised by what they receive in return. In the long run, the personal changes could be more profound than anything experienced on the mission field.